“Hi, Violet,” said the man in the orange “ASPCA Volunteer” shirt. He set up a little folding camp stool, fired up his iPad and began to read aloud in a gentle, even voice. Inside her glass kennel on Monday afternoon, Violet, a black-and-white pit bull mix, lay on her bed with her head held low. After a few more sentences, something shifted in Violet and she cocked her head toward the man, Ricky Gitt, for a few seconds: a brief moment of connection. Through the doors of the American Society for the Prevention of Cruelty to Animals on the Upper East Side pass hundreds of dogs rescued by the police in abuse cases. The society’s goal is to get them adopted, but many are so traumatized that they cannot handle human contact. That’s where story time comes in. 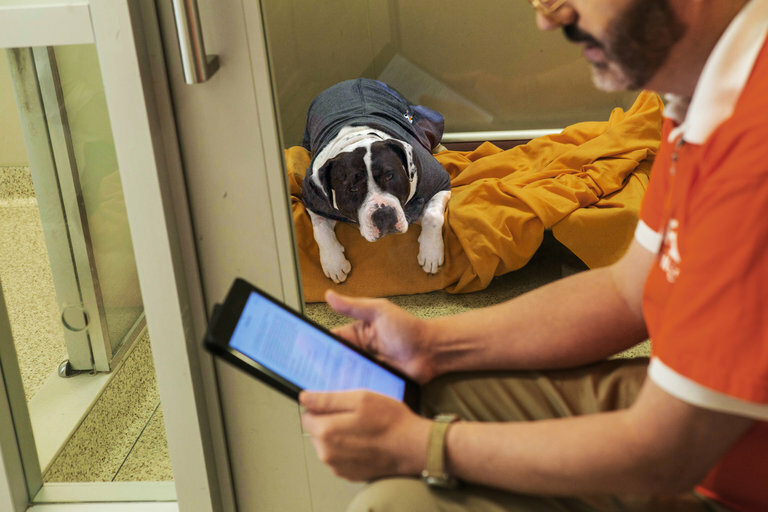 For 20-minute stretches, volunteers read to dogs, who listen through “sniff holes” in the glass of their kennels. The reading material does not seem to matter much. Mr. Gitt, 58, an interior designer, happened to have started the Wallace Stegner novel “Crossing to Safety.” Other readers bring children’s books or magazines. “As long as you read in a nice soothing voice, they enjoy it,” said Hildy Benick, 69, a volunteer who has been with the reading program since shortly after it started, in late 2013. Ms. Wells got the idea for the program after years of playing guitar — mostly Beatles songs — to recovering dogs. “Not everyone knew how to do that, and I wanted to come up with something anyone could do,” she said. The benefits of reading are hard to measure since the dogs also get a full range of training and behavioral therapy. But it makes a difference, Ms. Wells said.